This paper presents the advantages of taking into account the distribution of the individual wage gap when analyzing female wage discrimination. Several limitations of previous approaches such as the classic Oaxaca–Blinder and the recent distributive proposals using quantile regressions or counterfactual functions are thoroughly discussed. 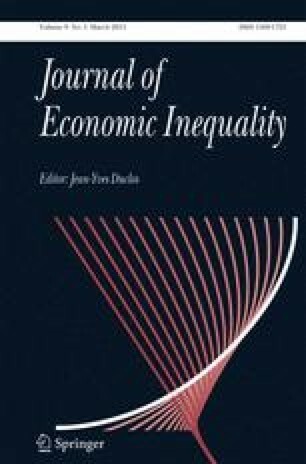 The methodology presented here relies on Jenkins’ (J Econom 61:81–102, 1994) work and supports the use of poverty and deprivation literature techniques that are directly applicable to the measurement of discrimination. In an empirical illustration, we quantify the relevance of the glass ceiling and sticky floor phenomena in the Spanish labor market.